is specially formulated to provide clean refreshing toning without the harsh drying effects of alcohol. It will not strip your skin of its own natural moisturisers. Special mild purifiers gently remove impurities and recondition your skin, making it feel fresh, clean and soft. Easily removes all traces of dirt, oil and make-up from deep within pores. 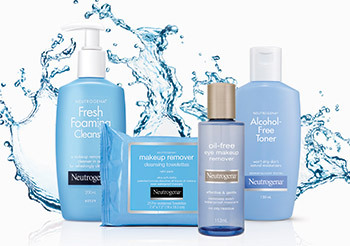 Rinses completely clean, with no pore-clogging residue for refreshingly clean skin. This gentle, foaming, dermatologist tested formula effectively removes make-up and cleanses in one easy step, for refreshingly clean skin. Easily removes dirt and oil without over-drying. Removes make-up, even waterproof eye make-up, without stinging or irritating the sensitive eye area. This 100% oil-free liquid activates when shaken to gently whisk away even waterproof eye make-up without any tugging, pulling or stinging. Your skin is left feeling clean and fresh with no oily residue. Aloe and Cucumber extracts soothe skin. Gentle, ultra soft cloths offer you superior cleansing and make-up removal.